Licensed to practice before the United States Supreme Court, the Ninth Circuit, the Fifth Circuit and all California state and federal courts. 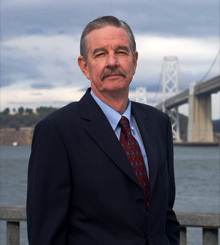 Mr. Gibson began practicing maritime law in San Francisco in 1971 and is a founding partner of Gibson Robb & Lindh. Effective January 1,2014, he changed his status from Partner to Of Counsel to the firm. He will continue his practice with the firm and it clients. He is one of the leading maritime and litigation attorneys on the West Coast, having tried over 40 cases to judgment/verdict and having handled numerous appeals. He specializes in maritime casualty and insurance litigation, focusing on subrogation, charter parties, tug & tow, salvage, general average and complex marine insurance issues arising out of cargo, hull, P&I, marina liability and excess policies, including defense of bad faith actions. He has been an expert witness in a bad faith action involving marine insurance. Mr. Gibson is a recognized expert in cargo transportation matters including handling cargo loss and damage claims arising out of international ocean, air and domestic transit. Cargo insurers frequently consult him regarding the effect of proposed policy language changes. He also advises shippers regarding contracts entered into with carriers and has developed a comprehensive cargo loss/damage recovery program for a high volume international shipper of goods. Mr. Gibson regularly advises vessel owners and charterers in contractual matters including preparing charter parties, towage agreements and marine service agreements. He has successfully arbitrated claims on behalf of clients arising out of such agreements. In recent years, litigants seeking to resolve cases arising out of maritime and transportation matters, including related insurance disputes and personal injury, have called on Mr. Gibson to privately mediate their disputes. He has successfully resolved numerous maritime cases as a mediator. With his change of status to Of Counsel, he will focus to a greater extent on providing mediation services to those parties in need of an expert maritime attorney to serve as a mediator. Mr. Gibson continues to be a member of the Northern District of California's panel of Early Neutral Evaluators for maritime cases. Mr. Gibson has been an adjunct professor of law at the University of San Francisco School of Law since 2001 where he teaches Introduction to Maritime Law and, in 2014, began teaching The Law of Marine Insurance. He is on the Board of Advisors to the University of San Francisco Maritime Law Journal and is past chairman of the Education Committee of the Association of Marine Underwriters of San Francisco. At the invitation of the Chinese government, he gave a series of lectures on U.S. COGSA and the U.S. Foreign Sovereign Immunities Act at the Shanghai Maritime Institute in Shanghai. He was a Speaker/Panelist at the prestigious Admiralty Law Institute program on Tug & Tow Issues at Tulane University in 1995. Sky Reefer Muddies the COGSA Waters, University of San Francisco Maritime Law Journal, Fall 1996 (lead article). The Development of Unreasonable Deviation Under U.S. COGSA, University of San Francisco Maritime Law Journal, Summer 1991 (lead article). Named as one of Northern California's Transportation & Maritime Super Lawyers by Law & Politics Magazine and San Francisco Magazine every year beginning in 2004 to the present. The honor is awarded to those lawyers who are among top five percent of Northern California attorneys based on input by their peers and review by a Blue Ribbon panel. Named by Best Lawyers as one of the best lawyers in America in Maritime Law. Mr. Gibson has been included in Bay Area Lawyer Magazine’s list of Top Lawyers in the Bay Area in the field of litigation.